Aeropark is a very famous airbase in Budapest. It is a complete delight for people who love to fly or are intrigued by the art of flying. Although used for various internal functions, this place can be visited with prior permission. Some days of the year you can just pass by and see what goes behind making one of the most popular bases of Budapest. You can find out about the history in depth from people working here and they will be sure to give you information if you are willing to lend an attentive ear. By hired taxi or by car from the city. People normally club together Polgàrmesteri Hivatal Örkèny and St Stephens Basilica while planning their visit to Aeropark. A collection of interesting Hungarian civil aviation aircraft. Most aircraft are open to look inside and sit in the cockpit - great for photos. There's some missing written English information, but the staff are friendly and will try to answer any questions you have. Seemed more interesting than it is. The guides did not speak a fluid English and weren’t very helpful. It was a great spot to practice airplane photography though :). Although I saw the place upon my arrivals to Budapest on 28.11.2015 and 26.05.2016, plus my departure from here on 29.05.2016 only from outside on the way from and on the way to the airport, the planes on display seemed interesting to me. 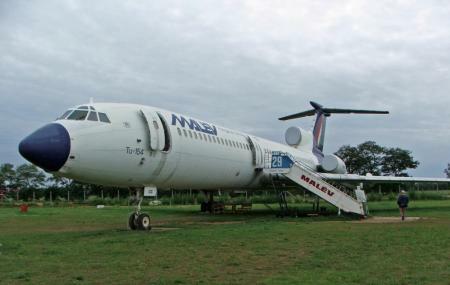 The open air display not only shows the aircrafts that had been used during a period in the Hungarian civil aviation history, but also informs that Hungary used to have a national aviation company, Malev, which is currently defunct.